Marriage begins when the wedding ceremonies end and the lights are turned off. You are literally left on your own. Whether you married your lover or don't know your partner much, marriage makes you see those facets of your partner which you never saw. Therefore, the 1st year is very crucial for building a firm foundation on which your life-long marriage will stand tall. Below are some of the tips and tricks that turned out to be very helpful while they were never consciously applied. 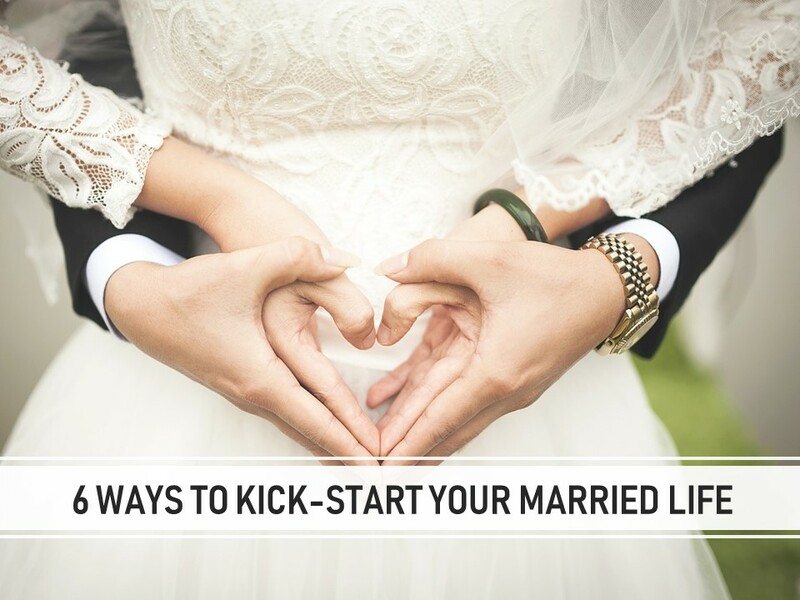 Therefore, "Kick-Start Your Married Life in 6 Mature Ways"
Behave as if him/her is the one. Because him/her IS THE ONE - after marriage do not fiddle with your mind and question your decision. This will hamper all the other activities that goes into making household and caring for the other. Now that you are married behave with love, care and attention. Misunderstandings are evident and so are fights. But understand that it is the issue at hand or the situation which is bad not the person. Learn from Fights - fights every week or every day is a normal part of married life. In fact, those who don't fight are living a non-existent relationship. We only fight with those with whom we have expectations, love and understanding attached. No fights mean that the person hardly matters to you, alive or dead, successful or a failure. People ask me "what are the fights you and your husband have on? We have never seen you both argue". I reply that "we did and do not repeat the fights and over these 5 years, our topic of fights have lessened". Our 1st year was most horrendous in terms fights despite us being together for 6 years before wedding. But unintentionally, we never repeated the same mistake or made the other hurt on the same issue again. As a result, we resolved each logjams as it came in the way and cleared our path. No Faking - faking means giving a wrong impression about yourself to the other. Post-marriage give a clear idea of who you are and what are your preferences. This will not let false assumptions to build. If you dislike parties in the club and prefer quiet time at home, say it. The other person wont get a dream on what you want. If you hate making bed or do not want to be the last person switching off the lights before sleep, say it. Secondly, if you fancied clean shaved and well-groomed men and frown because your husband doesn't maintain himself, accept that not all days of the week and month men shave. Men also accept that once charming girl they met, they cannot have it everyday, and tiny hair growth and unwaxed legs are part of women's body too. Married couples are not meant for wooing each other everytime and it is completely normal to bring out your flaws. You are Partners not Competitors - in everyday situation itself, competition can creep in but consciously do not let that happen. Imagine going for shopping for home décor. Do you try to impose your will? Incorporate each other's tastes and liking. If the man prefers brown cupboards then do not cry for pink. Keep pink for that section of your house which you will dominate like dresser. Do not make the mistake of counting and becoming happy on all things you made the other sacrifice. Ask their choice of restaurant and if it doesn't matches yours, see if the selection of food can be of your choice. Learn to Cook - Cooking is a great way to impress the other, become creative and start a healthy eating habit. Both husband and wife must cook and bonds will grow over chopping vegetables, brewing tea, simmering soup, and grilling chicken. I have benefitted so much with my cooking skills and the surprise on my husband's face after seeing what I prepared today gives me tons of happiness. Conversely, when he would cook, I know today I'm in for a treat. Him wanting to cook has always been a sign for his day being very good and productive, is super happy about something, or exuberating lots of love for me. Have a common friend* - I never gave emphasis to this point until I saw its benefits. Human beings are not geared to tell each and everything to the other. And we either stay quiet or let it out in a fierce manner later. For instance, if you wanted a surprise, but other doesn't think it is important and never planned one, you will meet sadness. Over here a common friend helps. On my Birthday, my husband gave a present a few days before and so there wasn't really anything he was about to give the day it was birthday. I kept quiet because I knew my gift (and I loved it) is with me. But I did crave for something on that day too. This common friend told him "she is waiting for a rose". And he surprised me. Days later I got to know about the positive influence of our common friend. I can go on and on about what all made and still making my marriage kick but for now begin to apply these in your life and see the difference.